Baltimore is gearing up for a huge influx of tourists in the next week as the Star-Spangled Spectacular steams into the Inner Harbor and other locations along the city’s famed waterfront. The event, which celebrates the 200th birthday of the national anthem, officially kicked off yesterday at Fort McHenry, but begins in earnest today with the arrival of tall ships and naval vessels from across the world. It runs until Tuesday, Sept. 16th when these ships depart. In the days between, the Star-Spangled Spectacular will feature everything from air shows, concerts, and food to ship tours and a fireworks show designed to replicate the bombardment of Fort McHenry. All of this is expected to draw over one million people to Baltimore. The event is being held to commemorate the 200th birthday of the national anthem, which was born during the Battle of Baltimore on September 12-15, 1814. 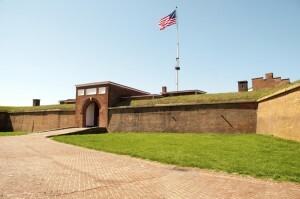 Inspired by the American’s successful defense of the city against the British bombardment of Fort McHenry, Francis Scott Key composed a poem titled “Defense of Fort McHenry.” The first stanza of the poem later was set to the tune of the song “To Anacreon in Heaven” (ironically, composed by the Englishman John Stafford Smith) and became “The Star-Spangled Banner” as we know it today. The song gained popularity throughout the 1800s, and was officially adopted as the national anthem in 1931 by President Herbert Hoover. With a total impact estimated at $166.1 million, the impact of Sailabration compares favorably to national sports leagues, large trade shows, and political conventions. Survey research shows that more than 1.1 million Marylanders experienced the event, while another 435,000 visitors came from out-of-state. Survey respondents included residents of 23 other states, reaching as far as Massachusetts and Connecticut to the north, Florida, Texas and Mississippi to the south, and California, Colorado and Oregon to the west. 68.3% of visitors are very likely or likely to attend another SS200 event in Maryland commemorating the War of 1812. 28% of survey respondents residing outside the city experienced the Inner Harbor/downtown for the very first time this year. The city will be showcased on three separate live television broadcasts. Over a million people are once again projected to visit Baltimore during this year’s event. With a Ravens home game against the Steelers on Thursday night and Derek Jeter’s final trip to Camden Yards with the Yankees this weekend, it is sure to be an exciting stretch of days in Baltimore. Be sure to join in the fun! The stars and stripes flies over Fort McHenry in Baltimore. Email us at info@obaltimore.com for more info or to connect. This entry was posted on Wednesday, September 10th, 2014 at 6:12 pm. Both comments and pings are currently closed.